There are nine legislative assembly constituency in Sitapur district for the 2017 Assembly elections. They are 149 Biswan, 147 Hargaon, 148 Laharpur, 151 Mahmoodabad, 145 Maholi, 153 Misrikh, 150 Sevata, 152 Sidhauli, 146 Sitapur. When Uttar Pradesh assembly election 2017 is getting ready to electios new Assembly, Sitapur is not anywhere behind in the election heat. 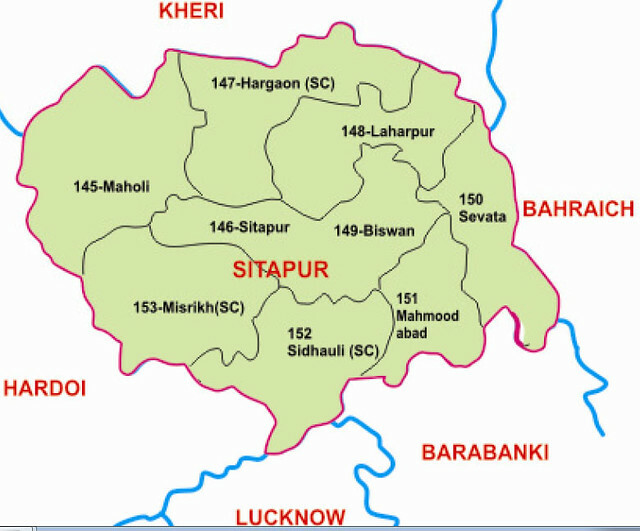 Sitapur (Hindi: सीतापुर जिला, Urdu: ستا پور ضلع‎) is one of the districts of Uttar Pradesh state of India, with Sitapur town as the district headquarters. Sitapur district is a part of Lucknow division.